Philip: I see in your résumé you went to graduate school in psychology, so your familiar with crazy people? Quincy: Mostly from living in L.A. In 2004, Jamie Foxx has completed a sort of cinematic trifecta. The one-time standup comedian has shown his skills in an action thriller (Collateral); created the kind of buzz for a performance that usually results in major award consideration in the upcoming Ray; and crafted a performance in a television movie (Redemption) that earned him nearly unanimous acclaim. It is becoming more and more evident that it is no longer a question of whether Jamie Foxx will earn an Academy Award, but rather when. 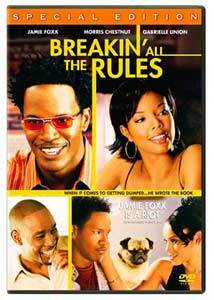 Another film released in 2004, but to less fanfare than the previously mentioned pictures is Breakin All the Rules, a sweet romantic comedy that combines several different elements that seem essential to the creation of films in the genre. This is another film where we know the outcome and are never thrown off the trail when a situation appears to threaten whether or not the couple at the center of the romance will get together, and yet I generally appreciated the film. Foxx plays Quincy Watson, an up and coming magazine writer who has a successful professional life, and a faltering personal one. When his boss (MacNicol) charges him with a list of firings that need to happen because the publication has fallen on hard times, it is explained that Quincy is charged with the task simply because, as the old saying goes, "stuff" rolls down hills. So rather than fire those in question, Quincy quits his job, which is par for the course with his personal life as his girlfriend has just dumped him. In a fit of depression, Quincy begins to compose a breakup letter, the numerous drafts of which become a book, a handbook specifically, for those who want to avoid being dumped or be the "dumper" rather than the "dumpee." When Quincy's cousin Evan (Chestnutt) comes calling for a favor, Quincy accepts without knowing exactly what he has to do. Evan is dating Nicky (Union) and wants to end things with her before she does so with him, so Evan convinces Quincy to go in his stead and break things off. In typical romantic comedy fashion Nicky has gotten a haircut, and looks nothing like the description that Evan has given Quincy. So Quincy mistakenly begins to chat up Nicky and the pair hit it off, and a love is born. I will leave it to you to guess what ensues next. While not exactly a blockbuster, Breakin All the Rules should do respectable business on home video based on both the popularity of its stars and because the film is a genuine winner. This is far from groundbreaking cinema, but writer/director Daniel Taplitz does a nice job of keeping the pace breezy, never bogging the script down with ludicrous situations or silly gags to help pass the time. Taplitz is also helped greatly by a near-perfect cast. Union has the kind of personality that could light up a room, her scenes with Foxx offer up some absolutely terrific chemistry and in these sequences the film has an romantic feel that is missing from so many others in the genre. For Foxx, this is his first true starring vehicle, after supporting but memorable parts in other films, and he pulls it off wonderfully. He plays the sad sack protagonist to the hilt and his work here is both comic and emotional. This is a very fine performance in a role that, while not requiring much, shows off the range of this young and talented actor. Breakin All the Rules is absolutely charming performances and a screenplay that offers up numerous instances of snappy and fun dialogue. Sometimes, when a romantic comedy can actually make you laugh and smile that is all you can ask for, and this film delivers. Image Transfer Review: Breaking All the Rules is presented in both a 2.35:1 anamorphic widescreen transfer as well as a horribly cropped 1.33:1 full-frame one, and as usual, this review pertains only to the widescreen edition. Overall, the transfer is done nicely with some grain and dirt occasionally marring the quality of the print used. Some of the scenes suffer from an abundant softness that hampers the quality of the sharpness and the detail. There are no significant signs of edge enhancement while there is no bleeding on the more vibrant colors. Audio Transfer Review: The Dolby Digital 5.1 mix is, as one might expect from a romantic comedy, based heavily in the center channel. Dialogue is crisp and clear with no distortion or dropouts evident, while the split surround speakers do see some use on occasion with some ambient sounds scattered throughout. This is a nice, but frighteningly average mix. Extras Review: A handful of typical extras and one rather strange inclusion comprise the bonus material for Breaking All the Rules. First is a commentary by director Daniel Taplitz and star Gabrielle Union. The track is a breezy discussion of the film as Taplitz takes control and talks about his ideas for the film originally and how he assembled his cast. Union is on hand to offer a few anecdotes, but for the most part the track is dominated by Taplitz. A brief "making-of" featurette is included, along with a television interview that is featured early in the film, here it is presented in its entirety. A collection of mildly amusing outtakes are also included. Now we come to the strangest extra feature of the bunch. Included here amongst the commentary and promotional filler is a Three Stooges short. Normally this would be case for celebration, but the short (Hoi Polloi) has been colorized for some strange reason. While I applaud the inclusion of the short, I am disappointed by the colorization. A nice thought to be sure. Featuring a nice performance from Foxx, and an equally charming one from Union, Breakin All the Rules is a nice romantic comedy that is neither groundbreaking or thought-provoking but is a justifiable rental. You could do a lot worse.